A wild match between the Northwest rivals wound through 120 minutes and penalty kicks before the Timbers shocked the Sounders to end Seattle’s season. After 120 minutes of intense physicality Thursday, after consecutive games this week, after 43 years of rivalry, the best game ever between the Seattle Sounders and Portland Timbers came down to damnable penalty kicks. The Timbers were better. The Sounders were aghast. The sellout crowd of nearly 40,000 was stunned. The one-time worst team in the Western Conference transformed into one of MLS’s best in a single season, the Sounders failed abruptly in the Western semifinals to its most arch of rivals. “A little lower than the gut,” he said, offering the smallest of rueful smiles. Wherever was the exact point of figurative anatomical grief, there was no mistaking its depth and breadth. Was this the toughest loss in his considerable history with the Cascadian drama? The Sounders finally lost their grip on a season almost perpetually on edge. “This year, it got us,” Bruin said. “You can’t always be pulling it out at the end and be scrambling to get a result, because things like this are going to happen. A wild night of turns eventually turned against the second-seeded Sounders to deny them a third consecutive appearance in the West finals. After a 3-2 match win tied the aggregate series 4-4, the penalty kicks went 4-2 to Portland. Reserve forward Dairon Asprilla had the pleasure of slipping in the figurative shiv, celebrating with a cartwheel and a back flip before being mobbed in the suddenly silent cavern that moments earlier was throbbing. Bruin and Ozzie Alonso, the venerable original Sounder, each misfired. Alonso’s shot was blocked, and Bruin hit the far post. Nicolas Lodeiro, the Sounders’ best player, never took a shot. He asked to go fifth, but the shoot-out never made it that far. “I’ve practiced that one to the bottom corner,” Bruin said. ” I didn’t change anything up in my routine. I just pulled it a little. The Sounders can’t complain about bad bounces, because they had a great one in the 68th minute when Portland goalie Jeff Attinella came way off his line to grab a ball that he couldn’t hold. As he fell, the abandoned ball bounced twice before Raul Ruidiaz smashed into the net. The game’s first score not only broke open a conservative, almost apprehensive game, it made the Sounders too giddy. 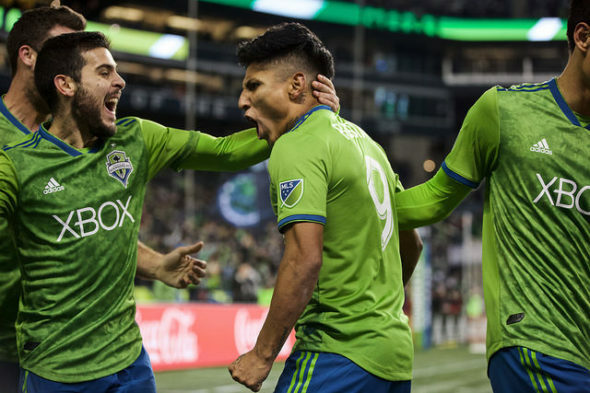 After scoring a road goal in Portland Sunday in the 2-1 Timbers victory in the home-and-home series, all the Sounders needed was a 1-0 win to advance. That lead lasted 1o minutes. Timbers star Sebastian Blanco leveled matters with a blistering shot from the top of the box that caught the Sounders defense — missing veteran anchor Chad Marshall, who had knee surgery Tuesday to repair meniscus torn in the Sunday match — out of position. Portland had its road goal. They did let their guard down. All the Timbers needed to do was hold serve to advance. They too, failed. As the tension built through the six minutes of stoppage time, Blanco attempted to clear the ball with his head away from the Portland goal. Instead, he sent it to the middle, where Ruidiaz leaped and swung his leg horiziontally and violently. The game was tied, bedlam was back and two 15-minute overtime periods beckoned. The Timbers pounced again, Asprilla nailing a header just two minutes in. Three minutes later, the Sounders answered. A handball call in the box offered Lodeiro a penalty kick that he easily converted. Even though the final 23 minutes played out without a score for a 3-2 Seattle match win, Timbers players believed they had won the series and began with celebratory hugs and high fives. They were unaware that, in the obtuse arcana of the MLS playoff system, the weighted road goals no longer counted in overtime in an aggregate series. Finally the Timbers coaches unwound their players’ bizarre confusion, and managed to pull together a team playing its third game in eight days and fourth in the past 11 to prevail in PKs against a higher-seeded, more rested Seattle outfit. The swings in momentum stood in contrast to steady intensity the Timbers brought to a hostile house. They were rewarded with a series win, after taking two of three from Seattle in the regular season. Rookie Timbers coach Giovanni Savarese was impressed after his exposure to the MLS’s premier rivalry. “Seattle and Portland brought the rivalry to this match and it was incredible,” he said. “There were moments when they scored, it looked like it was going to be difficult for us, then it was back and forth all the way to PKs. It was. But for a team that set an MLS record with nine consecutive wins, and another record for the best second half-season (14-2-1), and won 14 of their final 16 to escape the playoffs’ knockout round, the curtain on the compelling theater came down way too soon. Incredible game and one of the best playoff games in Seattle sports history. Up there with Sonics v Rockets game 7 in 1993 western conf semis. Also went OT but Sonics won that one. PK’s are a meh way to end such an electrifying series. Kick in the nads is about right. Good analogy to G7 93. Best hoops game I’ve ever seen. PK’s are such a lame decision tool. Every sport has flaws; this is aoccer’s large one. that was a damn entertaining game, I have to say. but penalty kicks . . . abominable, like Art says. I mean, they’re an absurdity. it’s the only sport where they stop playing the actual game, and do something completely different to decide the outcome. I have a better idea (I know, the American always wants to improve soccer): how about 7 on 7 or something similar? fewer players, like they do in hockey. that way, at least they’re still playing soccer. a quick correction regarding penalty kicks: Art called ’em damnable, not abominable. which they are. still an excellent game. sports is entertainment after all. Every sport seems to have flaws by design or custom, but nothing to match the irksome PK to decide an outcome. My solution is to widen the goals to create more scoring and lessen the chance of draws. Where was Geoff Hurst when we needed him? I saw Alan Hinton in the press box. I’ll ask. Tell him Pepe Fernandez says hi. It would not surprise me if MLS gets rid of the two-game aggregate for the playoffs. Fans have been pointing out that the only “real” home-field advantage comes in the 3-6, 4-5 knockout round, as in the aggregate series the lower seed is guaranteed the same number of home games as the higher seed. The only real advantage the 1st.- and 2nd.- place finishers get is a bye to rest banged-up players, but that’s negated with the aggregate. I think the league is starting to understand that. Plus, fans pointed to this season’s knockout round as one of the most exciting in recent memory, and they would like to see that drama revived in the rest of the playoffs, like in the NFL’s system. The aggregate came about to assure playoff teams of one home game, but that symbolized a league that was desperate for gate. That’s still true in places, but less than it was. Getting rid of would also shorten the season. Timbers played their fourth game in 11 days. In 3 weeks Seattle has lost to the Ducks and Timbers. If the Sonics were around they’d probably lose to the Blazers. Though I had my doubts the Sounders could get past Sporting KC I was confident they’d move past the Timbers. Didn’t like the PK lineup. Clint Dempsey could have scored if he walked out onto the pitch last night. With Deuce gone I’m looking forward to seeing the kind of moves Garth makes in the offseason. Lodeiro asked to save him for No. 5, Backfired. Seems they already were replacing Dempsey with Jordan Morris, who now has to prove he’s the same player as he was pre-injury. Penalty kicks are a big reason I am not a soccer fan.To have a hard fought contest come down to that as a decider doesn’t do the match justification. We had a great season, unexpectedly, nonetheless. I bet you have plenty of reasons not to be a soccer fan.